Feeding a baby can make such a mess! I always found it so frustrating when I had to change my daughter’s clothes after each meal when the bib failed to offer any kind of protection. I wondered what the point was in even wearing one. However, there is a new bib that is unlike any other out on the market today. It’s called DaBib and it’s considered the elegant solution to out-dated bib design. In fact, its so popular that it even won the iParenting Media Award! Parents and Daycare Centres all over are impressed with its innovative design and exceptional fabrics and calling it “simply brilliant”. So what exactly is so great about DaBib? Well, it has a patented Scrunch Collar that actually stops leaks and keeps your baby’s clothing clean during the messiest of meals. The Patented Crumb Catcher opens up wide when your baby is wearing the bib to catch food and drink. Food hits an outside sealed seam instead of an inside seam making washing the bib much more simple. 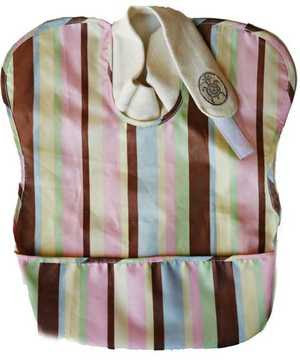 There is a front closure which makes it easier for the parent to put the bib on and take it off and its backing is waterproof and washable. 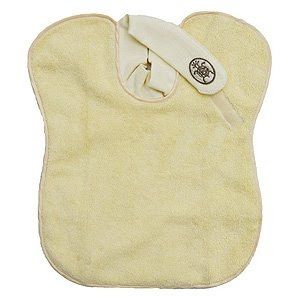 The fabric of the bib is micro-fiber terrycloth which is a highly absorbent and easy to clean fabric that is shrink resistant. The bib is extra long and wide and will cover your child from shoulder to shoulder which is something many other bibs don’t do. And of course it is non-toxic and lead free and exceeds the new US requirements. Hugs- super-absorbent, micro-fiber terry front and waterproof back; great in first year when diet is mostly liquid. 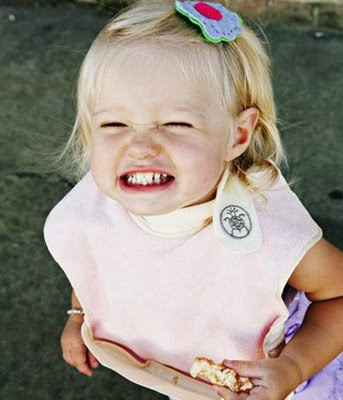 Giggles- wipe-off and waterproof; great for babies starting on solids. The DaBib I got to try out for my review is the “Hugs”. This was great for my sister to try out on my niece Avery who is 10 months old. She has started eating the jarred baby food and meal times can become quite the mess. I have to say I can see why DaBib won the parenting award because it really does the job well! I loved the front closure making getting it on and off Avery so easy. In other bibs, Avery was always getting baby food in the folds of her neck which can get really nasty. She hates having her neck wiped after meals. DaBibkept her neck clean and made cleaning up after mealtime much more relaxed for Avery and her caregiver! I think the best part about DaBib is the crumb catcher which is hidden in the back of the bib until you need to use it. Then it folds forward. This is great when Avery eats cheerios or crackers and the crumbs get all over the place. When the crumb catcher is open its nice and wide so it will catch any stray food that misses Avery’s mouth. Believe me that’s a lot since she wants to feed herself! DaBib also washes up beautifully in the washing machine and looks as good as new. The DaHugs in yellow was the one I received and it costs $12.99. I feel this is a fair price for its innovative design and it really does the job its meant to. To purchase DaBib, please visit their website. DaBib is offering my readers a 20% discount on their entire order when you use the coupon code MOM2009. If you order 3 or more, you get free shipping within the continental US.